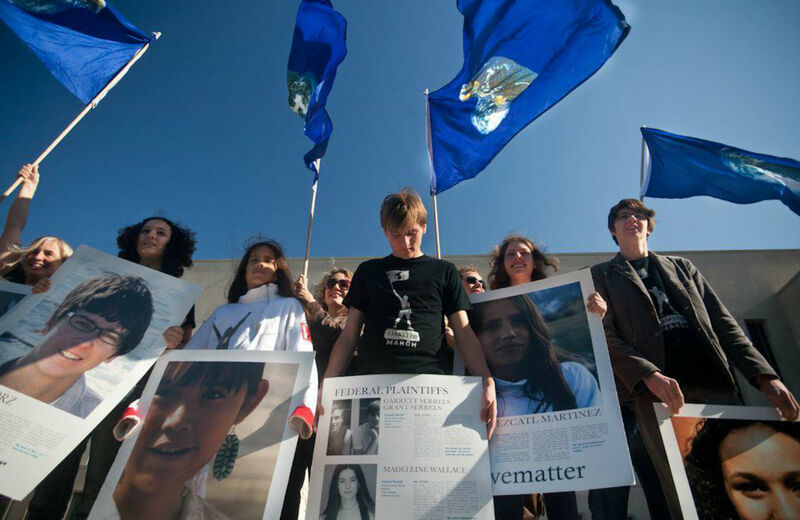 With little precedent for climate change litigation, youth turn to the public trust doctrine. The public trust doctrine has its roots in antquity, deriving from the Roman “Code of Justinian.” Elizabeth Brown of Our Children’s Trust, the group coordinating the legal efforts, explains that the doctrine is a duty all sovereigns have to safeguard public resources that future generations will depend on for survival. It is an “attribute of sovereignty,” “implicit in our constitution,” the “white board of our democracy,” she says. That’s true. There is no precedent. But that’s kind of the point. Conventional efforts to harness climate change through litigation have failed. The public’s trust in government to tackle climate change has been squashed. The agencies the youth are suing have come up short on the issue of the millennium. We’re clearly in need of some precedent-setting litigation. In tandem with the federal lawsuit, similar efforts by youth, also guided by Our Children’s Trust, are aimed at state agencies in Alaska, New Mexico, Oregon and Texas. In an amicus brief to the federal case, a group of sympathetic law professors explained that a legislature cannot deprive “a future legislature of the natural resources necessary to provide for the well-being and survival of its citizens…. Through the Public Trust Doctrine, the Constitution governs for the perpetual preservation of the Nation.” Since climate change would cripple the government’s ability to provide for its citizens, they argue, the use of the public trust doctrine is appropriate and necessary. Citing case law from the 1890s, these youth and their advisors are digging deep to find a tool to wield against a government that has legally betrayed their trust. Whether the case makes it to the Supreme Court has yet to be seen (the appeals court hearing is scheduled for May 2). But for the climate movement this is really a win-win. Either a landmark case compels the US government to act on climate change, or yet another betrayal of trust radicalizes an organized, and legally savvy, network of youth. Simon Davis-CohenSimon Davis-Cohen is a journalist and editor of the Ear to the Ground newsletter, an exclusive “civic intelligence” service that mines local newspapers and state legislatures from across the country.